Yeah, that’s a pretty accurate descriptor. A few weeks ago, I went with the Boy on vacation to Milwaukee to meet his friends and family, eat a ridiculous amount of tasty food, and listen to some fantastic live music. It was wonderful and I wrote about it here. Since then, life has gotten a bit more hectic: tires blowing out on the highway, family members needing surgery to repair injuries (so thankful for skilled doctors! ), and the beginning of the back-to-school nightmares. There’s a lot to do and not much time left to do it. So what do I do when I’m feeling overwhelmed? Yeah. I bake. And this time, it was a pie. Baking doesn’t make my glass case of emotions any easier to be in, but at least it all smells good. I normally don’t use pre-made things when I bake because I’m stubborn and a bit of a snob, but when I bought these cookies I immediately knew they’d be fantastic in a crust (they’re also equally amazing when dipped into chocolate milk and eaten while binge-watching Netflix). Eat one or four for quality control, then put the rest into a food processor. Pulse until you’ve got finely-ground cookies. I wrote that you want 2 cups of flour but really, you just want about 3 cups of dry ingredients (flour + ground cookies) in all. I poured the cookie pieces (grounds? puree? I’m not sure what to call them…) into the bottom of my 4-cup measuring cup and added about 2 cups of flour so that I had about 3 cups of dry ingredients. Mix well. This dough is STICKY, especially since you add 1 tbsp of pure maple syrup into the crust (and even more so if you spill the bottle of maple syrup on your counter like I did). I normally refrigerate my crusts for about an hour and then roll them out, but with this one I just greased up my pan and pressed it in (I used a springform pan but seriously, you can use pretty much whatever you’d like, pan-wise). Once your dough is spread across the bottom of your pan, pour that last tbsp of maple syrup in and brush it to coat the top of the crust with golden deliciousness. Once you’re done with your crust, work on the filling. You’ll need 1 pint of blueberries pureed and put into the pot, along with the sugar, maple syrup, cornstarch, gelatin, and salt. Mix it really well to make sure there’s no clumps of cornstarch (hint: use a whisk!) and bring to a boil over medium heat. You have to stir basically the entire time or you’re going to have burned blueberry goop all over your pan. No bueno. Let the mixture boil about 2-3 minutes. You’ll notice that it’s a much darker color than it was before and that it’s far more sticky. 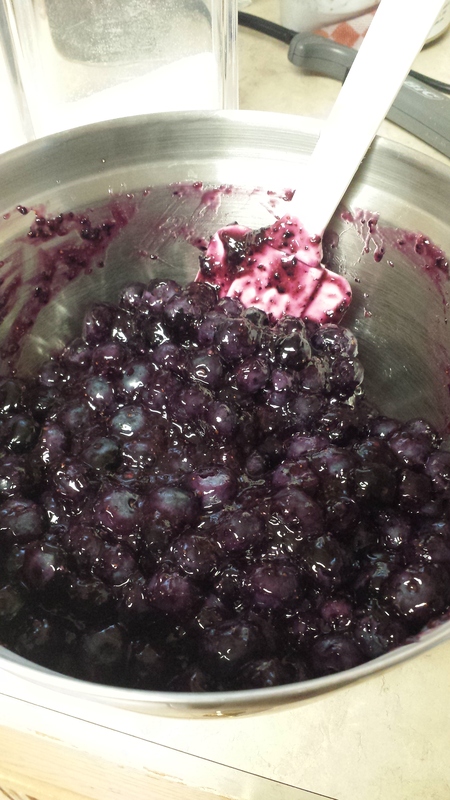 Pour mixture over the remaining blueberries and then stir with a rubber spatula, trying to cover every blueberry. Add the filling into the crust, bake for 30-35 minutes at 350º and then let it chill in the refrigerator for at least 4 hours. 1. In a large bowl, cream butter and sugar until pale and fluffy, about 3 minutes. 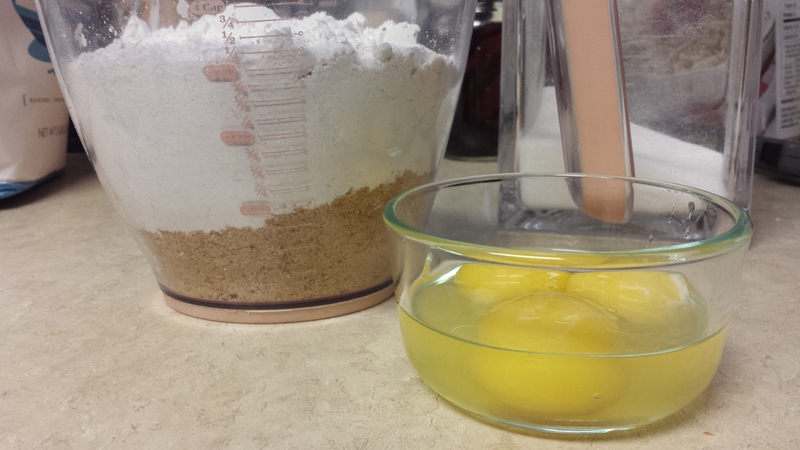 Add in egg and egg yolk, mixing well. Scrap down the sides of the bowl. 2. 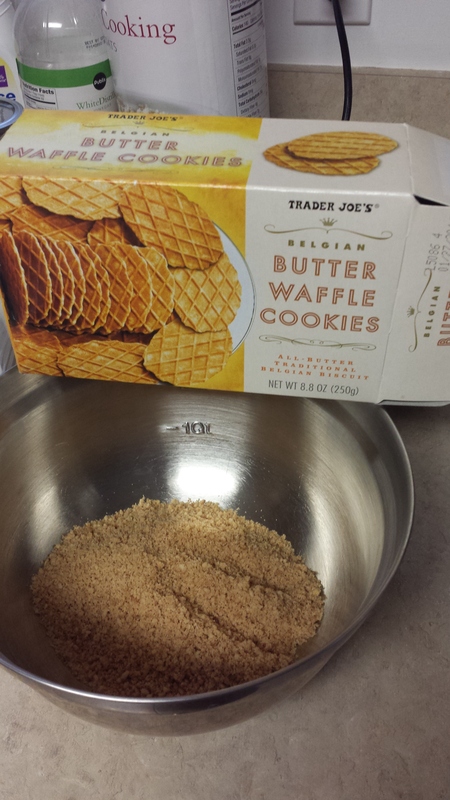 Add flour and pureed TJ’s Butter Waffle Cookies to butter mixture, about 1/4 cup at a time. Mix until just barely combined. 3. Drizzle 1 tbsp of maple syrup into the bowl and continue mixing until ingredients are combined well. 4. Generously spray a pie pan with nonstick spray (I prefer coconut). Press pie crust dough into the pan. 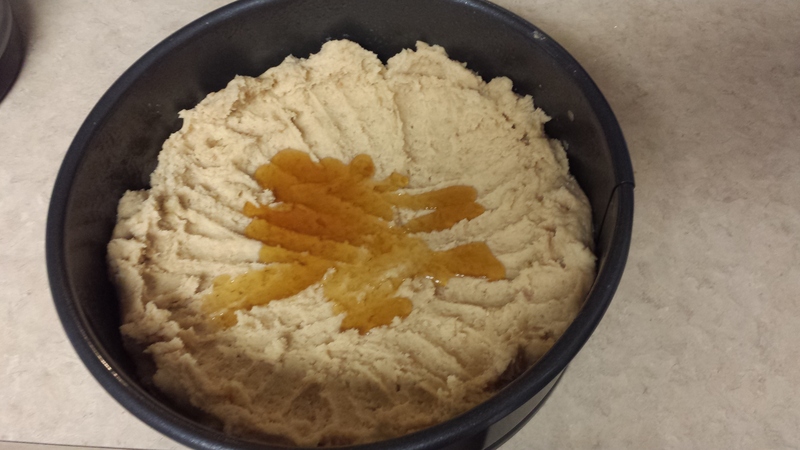 Brush the remaining 1 tbsp maple syrup on top of the dough before pouring in the filling. 5. Preheat the oven to 350º. 1. 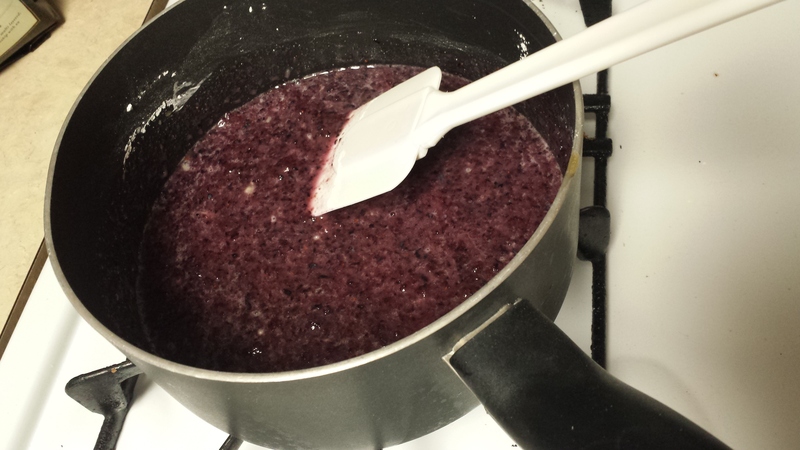 Puree 1 pint of the blueberries and pour into a medium saucepan. Add the other ingredients to the saucepan and mix well. 2. Heat over medium heat, stirring constantly. Allow mixture to boil for 2-3 minutes, until the consistency is thick. Remove from heat. 3. When the mixture has cooled slightly, pour over the other 3 pints of blueberries. 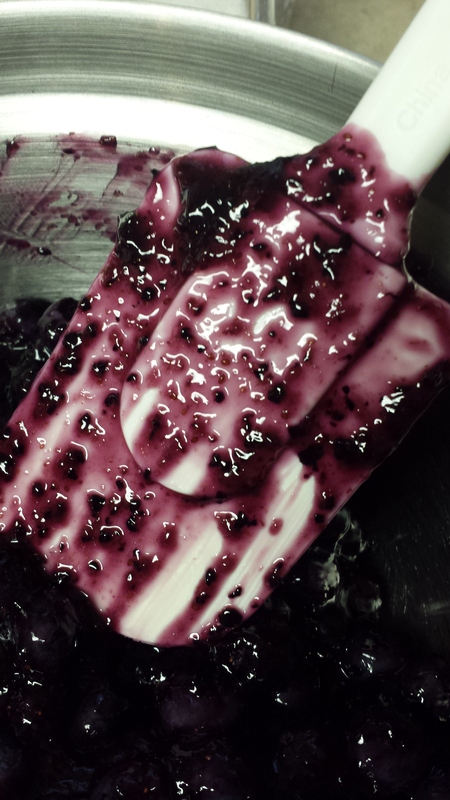 Use a spatula to mix well, trying to coat all blueberries. 4. 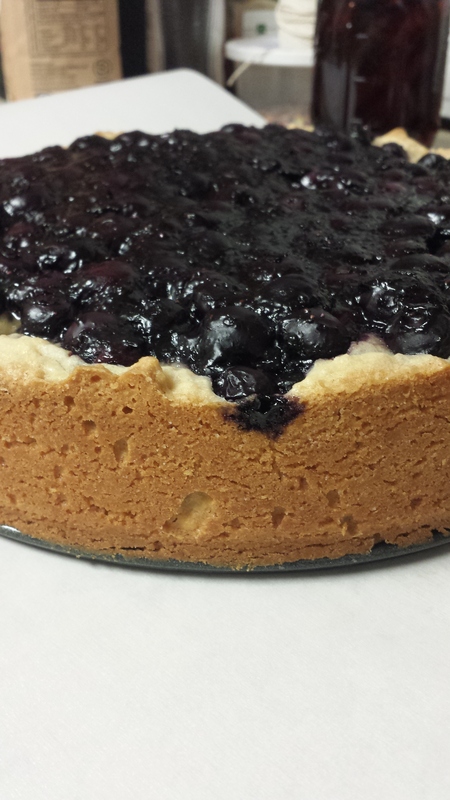 Pour blueberries into prepared pie pan. Bake for 25-35 minutes, until the crust is golden brown. Cool 4 hours (or overnight) and serve. I spent last week exploring Milwaukee with my Boy, his sister, and his sister’s husband. We ate far too much at their favorite local places, curled up in soft blankets and slept in a bit later each day, and danced, concert-style, to bluegrass, rock, and soul bands at Summerfest. I got to see both condos he’d like to buy if he lived in Milwaukee. He indulged my request for a photo of us which, since he is anti-selfie, meant he set up his fancy camera equipment in the middle of a park and raced across the bridge and up the steps to where I was sitting before the 10-second timer elapsed and the image was captured. (Some of these pictures are more flattering than others.) He held my hand while we drove and I met his people, an eclectic group so warm and welcoming you’d think I’dve known them for years. And when we sat on a bench outside of the Colectivo Coffee that overlooks Lake Michigan, all I could think was “yes. This. For the rest of my life,” even when he quoted the first 5 minutes of Forest Gump line-by-line (something I actually really enjoyed). Because that moment, sitting with that man, knowing that he respects me and values me and chooses me, was perfect. That moment, though, was vacation. It was five days that I got to spend with my boyfriend and without responsibilities. That gnawing reality of we-live-in-two-completely-different-cities was absent; I kissed him goodnight and then good morning hours later. When we had some of our more serious discussions, I was actually able to look into his eyes. You don’t know how much easier it makes those conversations when you can actually see the face of the person you’re talking to. But then, suddenly, it was Monday and we were packing again. One of Andy’s major “plus skills” is the ability to find an amazing deal and for this trip that meant staying at three different hotels. Since I had extra room in my suitcase, I nabbed the random things we had both purchased and packed them with my belongings, just like I had the last two times. This time, though, was different. We weren’t just packing to go to the next place, we were packing to go home. To our individual homes, in cities that are two-and-a-half hours apart. His shoes and Penzeys spices would need to wind up with him after we got off the plane and before I started my long drive home. And then my eyes welled up because I realized that he wasn’t just packing his socks and toothbrush into his suitcase, he had parts of my heart in there too, parts that I hadn’t planned on giving away to a man I’ve only known for 6 months, especially not one who is just so busy and far away. When we first started dating, Andy told me that the absolute hardest part would be distance. Long-distance relationships were something he had much more experience in and I didn’t doubt him. I don’t think I understood exactly how hard it would be and why it would be hard. Besides the typical “I just like being with him” stuff, there’s the “I don’t actually need my anxiety medicine when I’m with him!” part. And the “I want to take care of him” thing. And because of how well we connect, because I see glimpses of what it could be like when we’re together, it’s even harder to drive away from him at the end of the day. To feel like you’re closer than ever to something you’ve wanted your entire life and to know that you’re still not quite there yet is painful. For this season, however long it winds up being, I have to be patient. And, harder still, patient with a positive attitude. It’s hard. Really, really hard. And I know there are so many other people who have much more challenging situations than I do. I’ve heard stories from people who have happy, healthy marriages after spending chunks of their pre-marriage relationship apart from each other. It is inspiring and humbling. I wish that those stories made it feel easier but for now, this is just something that I have to walk through as it happens. One day, I will have someone who comes home to me after work, who I can cook for and talk to about his day. Someone with whom I can build my life, raise children, and grow old. And though that day is not today, it is ever-closer.